From Greek "adamas", 'invincible'. First known use by Manlius (A.D. 16) and Pliny (A.D. 100). The formation processes of the variety carbonado are unclear. The coexistence of diamond and carbonate minerals in mantle eclogites is explained by the reaction: dolomite + 2(coesite) -> <- diopside + 2(diamond) + 2O2 (Luth, 1993). Visit gemdat.org for gemological information about Diamond. Strain birefringence common (Raman and Rendall, 1944; Lang 1967; Howell, 2012). Octahedral crystals, also dodecahedrons, cubes, tetrahedral. Often has curved faces. Bort A black variety of Diamond. crystalline aggregates and is usually crushed into finer material. Carbonado A massive, opaque, gray, brown, or black variety of diamond used as an abrasive and in rock drills. Five different theories for the formation of carbonado have been discussed (cf. Sautter et al. 2011). Nano-Polycrystalline Diamond Nano-Polycrystalline Diamond (or NPD) is a completely transparent, polycrystalline synthetic consisting of randomly oriented, very tightly bonded nanoscale-sized diamond crystallites. Stewartite (of Sutton) A magnetic, ferrouginous variety of Diamond (bort) [Clark, 1993 - "Hey's Mineral Index"]. Originally reported from Kimberley pipe, Kimberley, Northern Cape Province, South Africa. framesite A variety of black bort from South Africa showing minute brilliant points possibly due to included diamonds. Graphite 3 photos of Diamond associated with Graphite on mindat.org. Calcite 2 photos of Diamond associated with Calcite on mindat.org. Pyrite 2 photos of Diamond associated with Pyrite on mindat.org. Pyrope 2 photos of Diamond associated with Pyrope on mindat.org. Almandine 2 photos of Diamond associated with Almandine on mindat.org. Serpentine Subgroup 1 photo of Diamond associated with Serpentine Subgroup on mindat.org. Ilmenite 1 photo of Diamond associated with Ilmenite on mindat.org. Garnet Group 1 photo of Diamond associated with Garnet Group on mindat.org. Grossular 1 photo of Diamond associated with Grossular on mindat.org. Olivine 1 photo of Diamond associated with Olivine on mindat.org. Greatest thermal conductivity known. A sizeable stone held in the hand feels cold, hence the slang name "ice". Cutting and grinding due to extreme hardness. Used for the windows on the Venera spacecraft to photograph Venus' surface. Goeppert, H.R. (1864) Ueber Einschlusse im Diamont. Haarlem: De Erven Loosjes. Emmanuel, H. (1867) Diamonds and Precious Stones; Their History, Value, and Distinguishing Characteristics, 266pp., London. Lindley, A.F., Capt. (1873) Adamantia - The Truth about the South African Diamond Fields. WH&L Collingridge, London. Richmond, J.F. (1873) Diamonds, Unpolished and Polished. New York: Nelson & Phillips. Dieulafait, L. (1874) Diamonds and Precious Stones. London: Blackie & Son. Reunert, Theodore (1893) Diamonds and Gold in South Africa. London: E. Stanford. Bonney, T.G., Prof., editor (1897) Papers and Notes (of H.C. Lewis) on the Genesis and Matrix of the Diamond. Longmans, Green & Co., London, New York and Bombay. Williams, Gardner F. (1902) The Diamond Mines of South Africa - Some Account of their Rise and Development. Crookes, Wm. (1909) Diamonds. London; Harper Brothers, first edition. Cattelle, W.R. (1911) The Diamond. New York, John Lane Co.
Fersmann, A. von and Goldschmidt, V. (1911) Der Diamant, 274pp. and atlas Heidelberg. Smith, M.N. (1913) Diamonds, Pearls, and Precious Stones. Boston: Griffith-Stillings Press. Laufer, B. (1915) The Diamond - A Study in Chinese and Hellenistic Folklore. Chicago: Field Museum. Wade, F.B. (1916) Diamonds - A Study of the Factors that Govern their Value. New York: Knickerbocker Press. Sutton, J.R. (1928) Diamond, a descriptive treatise. 114 pp., London: Murby & Co.
Farrington, O.C. (1929) Famous Diamonds. Chicago: Field Museum of Natural History Geology Leaflet 10. Palache, C. (1932) American Mineralogist: 17: 360. Williams, Alpheus F. (1932) The Genesis of the Diamond. 2 volumes, 636 pp. London. Palache, C., Berman, H., and Frondel, C. (1944) The System of Mineralogy of James Dwight Dana and Edward Salisbury Dana Yale University 1837-1892, Volume I: Elements, Sulfides, Sulfosalts, Oxides. John Wiley and Sons, Inc., New York. 7th edition, revised and enlarged, 834pp. : 146-151. Raman, C.V. and Rendall, G.R. (1944) Birefringence patterns in diamond. Proceedings of the Indian Academy of Science, A19, 265-273. Fersman, A.E. (1955) (A Treatise on the Diamond) Kristallgrafiya Almaza Redaktsiya Kommentarri Akadeika. Izdatelstvo Akademii: Nauk, CCCP. du Plessis, J.H. (1961) Diamonds are Dangerous. New York: John Day Co., first edition. Tolansky, S. (1962) The History and Use of Diamond. London: Methuen & Co.
Champion, F.C. (1963) Electronic Properties of Diamonds. Butterworths, London, 132pp. Berman, E. (1965) Physical Properties of Diamond, Oxford, Clarendon Press. Van der laan, H.L. (1965) Te Sierra Leone Diamonds. Oxford: University Press. McIver, J.R. (1966) Gems, Minerals and Diamonds in South Africa. Lang, A.R. (1967) Causes of Birefringence in Diamond. Nature, 213, 248-251. Chrenko, R., McDonald, R., and Darrow, K. (1967) Infra-red spectrum of diamond coat. Nature: 214: 474-476. Meen, V.B. and Tushingham, A.D. (1968) Crown Jewels of Iran, University of Toronto Press, 159pp. Lenzen, G. (1970) The History of Diamond Production and the Diamond Trade. New York: Praeger Pub. Pagel-Theisen, V. (1972) Diamanten-Fibel: Handbuch der Diamanten-Graduierung. 3. Auflage. Bardet, M.G. (1973-1977), Géologie du diamant, Volumes 1 thru 3, Orléans. Giardini, A.A., Hurst, V.J., Melton, C.E., John, C., and Stormer, J. (1974) Biotite as a primary inclusion in diamond: Its nature and significance American Mineralogist: 59: 783-789. Smith, N.R. (1974) User's Guide to Industrial Diamonds. London: Hutchinson Benham. Prinz, M., Manson, D.V., Hlava, P.F., and Keil, K. (1975) Inclusions in diamonds: Garnet Iherzolite and eclogite assemblages. Physics and Chemistry of the Earth: 9: 797-815. Treasures of the USSR Diamond Fund (1975) (in Russian with limited English). Vrindts, J. (1975) Diamantbewerking. Standaard Wetenschappelijke Uitgeverij. Orlov, Y.L. (1977) The mineralogy of diamond. Wiley & Sons, 235 pp. Bruton, Eric (1978) Diamonds. Radnor: Chlton 2nd. edition. Gurney, J.J., Harris, J.W., and Rickard, R.S. (1979) Silicate and oxide inclusions in diamonds from the Finsch kimberlite pipe. In F.R. Boyd and H.O.A. Meyer, Eds., Kimberlites, Diatremes and Diamonds: their Geology and Petrology and Geochemistry, Vol. 1: 1-15. American Geophysical Union, Washington, D.C.
Pollak, Isaac, G.G. (1979) The World of the Diamond, 2nd. printing. Exposition Press, Hicksville, New York, 127 pp. Legrand, J. et al (1980) Diamonds: Myth, Magic and Reality. Crown Publishers, Inc., New York. Newton, C.M. (1980) A Barrel of Diamonds. New York: published by the author. Devlin, Stuart (undated) From the Diamonds of Argyle to the Champagne Jewels of Stuart Devlin (Goldsmith to the Queen). Sing Lee Printing Fty., Ltd. Hong Kong. Milledge, H., Mendelssohn, M., Woods, P., Seal, M., Pillinger, C., Mattey, D., Carr, L., and Wright, I. (1984) Isotopic variations in diamond in relation to cathodoluminescence. Acta Crystallographica, Section A: Foundations of Crystallography: 40: 255. Sunagawa, I. (1984) Morphology of natural and synthetic diamond crystals. In I. Sunagawa, Ed., Materials Science of the Earth's Interior: 303-330. Terra Scientific, Tokyo. Grelick, G.R. (1985) Diamond, Ruby, Emerald, and Sapphire Facts. Meyer, H.O.A. and McCallum, M.E. (1986) Mineral inclusions in diamonds from the Sloan kimberlites, Colorado. Journal of Geology: 94: 600-612. Moore, R.O., Otter, M.L., Rickard, R.S., Harris, J.W., and Gurney, J.J. (1986) The occurrence of moissanite and ferro-periclase as inclusions in diamond. In 4th International Kimberlite Conference, Perth, Extended Abstracts; Abstract Geological Society of Australia, 16, 409–411. Meyer, H.O.A. (1987) Inclusions in diamond. In P.H. Nixon, Ed., Mantle Xenoliths: 501-522. Wiley, New York. Navon, O., Hutcheon, I.D., Rossman, G.R., and Wasserberg, G.J. (1988) Mantle-Derived Fluids in Diamond Microinclusions. Nature: 335: 784-789. Jaques, A.L., Hall, A.E., Sheraton, J.W., Smith, J.B., Sun, S.S., Drew, R.M., Foudoulis, C., and Ellingsen, K. (1989) Composition of crystalline inclusions and C-isotope composition of Argyle and Ellendale diamonds. In Kimberlite and Related Rocks, Volume 2: Their Mantle/Crust Setting, Diamonds and Diamond Exploration; Geological Society of Australia Special Publication, 14; 966–989. Blackwell Scientific, Cambridge, U.K.
Moore, R.O. and Gurney, J.J. (1989) Mineral inclusions in diamond from the Monastery kimberlite, South Africa. In Kimberlite and Related Rocks, Volume 2: Their Mantle/Crust Setting, Diamonds and Diamond Exploration; Geological Society of Australia, Special Publication, 14, 1029–1041. Blackwell Scientific, Cambridge, U.K. Otter, M.L. and Gurney, J.J. (1989) Mineral inclusions in diamonds from the Sloan diatreme, Colorado-Wyoming State Line kimberlite district, North America. In Kimberlite and Related Rocks, Volume 2: Their Mantle/Crust Setting, Diamonds and Diamond Exploration; Geological Society of Australia, Special Publication, 14, 1042–1053. Blackwell Scientific, Cambridge, England. Leung, I.S. (1990) Silicon carbide cluster entrapped in a diamond from Fuxian, China. American Mineralogist: 75: 1110–1119. Sobolev, N.V. and Shatsky, V.S. (1990) Diamond inclusions in garnets from metamorphic rocks: a new environment for diamond formation. Nature: 343: 742-746. Guthrie, G.D., Veblen, D.R., Navon, O., and Rossman, G.R. (1991) Submicrometer fluid inclusions in turbid-diamond coats. Earth and Planetary Science Letters: 105(1-3): 1-12. Harlow, G.E. and Veblen, D.R. (1991) Potassium in clinopyroxene inclusions from diamonds. Science: 251: 652-655. Navon, O. (1991) High internal-pressures in diamond fluid inclusions determined by infrared-absorption. Nature: 353: 746-748. Gems & Gemmology (1992) 28: 234-254. Harris, J. (1992) Diamond Geology. In J. Field, Ed., The Properties of Natural and Synthetic Diamonds, vol. 58A(A-K): 384-385. Academic Press, U.K.
Walmsley, J.C. and Lang, A.R. (1992) On submicrometer inclusions in diamond coat: Crystallography and composition of ankerites and related rhombohedral carbonates. Mineralogical Magazine: 56: 533-543. Walmsley, J.C. and Lang, A.R. (1992) Oriented biotite inclusions in diamond coat. Mineralogical Magazine: 56: 108-111. Luth, R.W. (1993) Diamonds, Eclogites, and the Oxidation State of the Earth's Mantle. Science: 261(5117): 66-68. Harris, H. (1994) Fancy Color Diamonds. Fancoldi Registered Trust, Lichtenstein. Schrauder, M. and Navon, O. (1994) Hydrous and carbonatitic mantle fluids in fibrous diamonds from Jwaneng, Botswana. Geochimica et Cosmochimica Acta: 58: 761-771. Bulanova, G.P. (1995) The formation of diamond. Journal of Geochemical Exploration: 53(1-3): 1-23. Shatsky, V.S., Sobolev, N.V., and Vavilov, M.A. (1995) Diamond-bearing metamorphic rocks of the Kokchetav massif (Northern Kazakhstan). In R.G. Coleman and X. Wang, Eds., Ultrahigh Pressure Metamorphism: 427-455. Cambridge University Press, U.K.
Leung, I.S., Taylor, L.A., Tsao, C.S., and Han, Z. (1996) SiC in diamond and kimberlites: Implications for nucleation and growth of diamond. International Geology Review: 38: 595–606. Marshall, J.M. (1996) Diamonds Magnified. Nappanee Evangel Press, second edition. Schrauder, M., Koeberl, C., and Navon, O. (1996) Trace element analyses of fluid-bearing diamonds from Jwaneng, Botswana, Geochimica et Cosmochimica Acta: 60: 4711-4724. Kopylova, M.G., Rickard, R.S., Kleyenstueber, A., Taylor, W.R., Gurney, J.J., and Daniels, L.R.M. (1997) First occurrence of strontian K-Cr loparite and Cr-chevkinite in diamonds. Russian Geol. Geophys. : 38: 405–420 (English translation from Geol. Geofiz.). Navon, O. (1999) Formation of diamonds in the earth's mantle. In J. Gurney, S. Richardson, and D. Bell, Eds., Proceedings of the 7th International Kimberlite Conference: 584-604. Red Roof Designs, Cape Town. Taylor, L.A., Keller, R.A., Snyder, G.A., Wang, W.Y., Carlson, W.D., Hauri, E.H., McCandless, T., Kim, K.R., Sopbolev, N.V., and Bezborodov, S.M. (2000) Diamonds and their mineral inclusions, and what they tell us: A detailed "pull-apart" of a diamondiferous eclogite. International Geology Review: 42: 959-983. Hutchison, M.T., Hursthouse, M.B., and Light, M.E. (2001) Mineral inclusions in diamonds: associations and chemical distinctions around the 670 km discontinuity. Contributions to Mineralogy & Petrology: 142: 119–126. Kaminsky, F.V. and Khachatryan, G.K. (2001) Characteristics of nitrogen and other impurities in diamond, as revealed by infrared absorption data. Canadian Mineralogist: 39(6): 1733-1745. Izraeli, E.S., Harris, J.W., and Navon, O. (2001) Brine inclusions in diamonds: a new upper mantle fluid. Earth and Planetary Science Letters: 18: 323-332. Kendall, Leo P. (2001) Diamonds: Famous & Fatal, The History, Mystery & Lore of the World's Most Precious Gem. Barricade Books, Fort Lee, NJ, 236 pp. (IBN 1-56980-202-5). Hermann, J. (2003) Experimental evidence for diamond-facies metamorphism in the Dora-Maira massif. Lithos: 70: 163-182. Klein-BenDavid, O., Izraeli, E.S., and Navon, O. (2003) Volatile-rich brine and melt in Canadian diamonds. 8th. International Kimberlite Conference, Extended abstracts, FLA_0109, 22-27 June 2003, Victoria, Canada. Klein-BenDavid, O., Logvinova, A.M., Izraeli, E., Sobolev, N.V., and Navon, O. 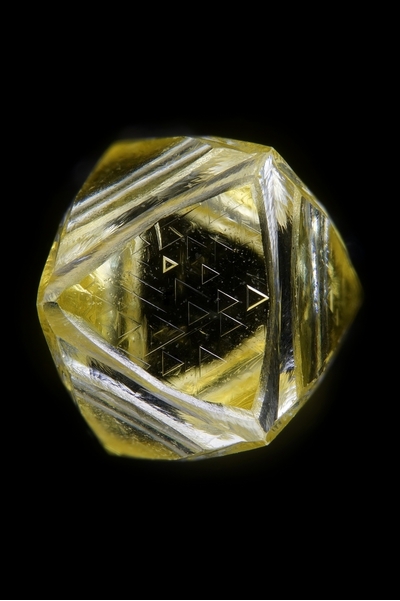 (2003) Sulfide melt inclusions in Yubileinayan (Yakutia) diamonds. 8th. International Kimberlite Conference, Extended abstracts, FLA_0111, 22-27 June 2003, Victoria, Canada. Logvinova, A.M., Klein-BenDavid, O., Izraeli E.S., Navon, O., and Sobolev, N.V. (2003) Microinclusions in fibrous diamonds from Yubileinaya kimberlite pipe (Yakutia). In 8th International Kimberlite Conference, Extended abstracts, FLA_0025, 22-27 June 2003, Victoria, Canada. Navon, O., Izraeli, E.S., and Klein-BenDavid, O. (2003) Fluid inclusions in diamonds: the Carbonatitic connection. 8th International Kimberlite Conference, Extended abstracts, FLA_0107, 22-27 June 2003, Victoria, Canada. Izraeli, E.S., Harris, J.W., and Navon, O. (2004) Fluid and mineral inclusions in cloudy diamonds from Koffiefontein, South Africa. Geochimica et Cosmochimica Acta: 68: 2561-2575. Klein-BenDavid, O., Izraeli, E.S., Hauri, E., and Navon, O. (2004) Mantle fluid evolution - a tale of one diamond. Lithos: 77: 243-253. Hwang, S.-L., Shen, P., Chu, H.-T., Yui, T.-F., Liou, J.G., Sobolev, N.V., and Shatsky, V.S. (2005) Crust-derived potassic fluid in metamorphic microdiamond. Earth and Planetary Science Letters: 231: 295. Klein-BenDavid, O., Wirth, R., and Navon, O. (2006) TEM imaging and analysis of microinclusions in diamonds: A close look at diamond-growing fluids. American Mineralogist: 91: 353-365. Gurney, J.J., Helmstaedt, H.H., Richardson, S.H., and Shirey, S.B. (2010) Diamonds through Time. Economic Geology 105, 689-712. Tappert, R. and Tappert, M.C. (2011) Diamonds in Nature: a guide to rough diamonds. Springer, 142 pp. Shkodzinsky, V.S. (2011) Nature of different compositions of inclusions in diamond. Zapiski RMO (Proceedings of the Russian Mineralogical Society) 140, 92-99 (in Russian). Howell, D. (2012) Strain-induced birefringence in natural diamond: a review. European Journal of Mineralogy, 24, 575-585. Shirey, S.B. and Shigley, J.E. 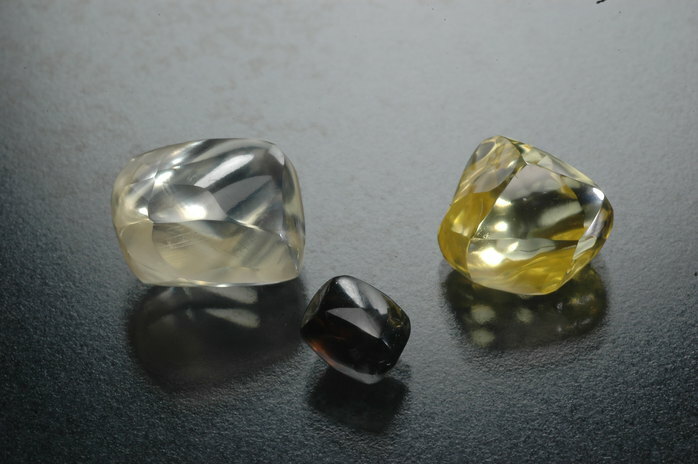 (2013) Recent Advances in Understanding the Geology of Diamonds. Gems & Gemology 49, 188-222. Nasdala, L., Grambole, D., Wildner, M., Gigler, A.M., Hainschwang, T., Zaitsev, A.M., Harris, J.W., Milledge, J., Schulze, D.J., Hofmeister, W., and Balmer, W.A. (2013) Radio-colouration of diamond: a spectroscopic study. Contributions to Mineralogy and Petrology, 165, 843–861. The following Diamond specimens are currently listed for sale on minfind.com. Russell, S. S., Arden, J.W. & Pillinger, C.T. (1992) Adrar 003: an Unequilibrated Ordinary Chondrite Rich in Pristine Interstellar Grains. (Mar 1992). ; Russell, S.S., Arden, J.W. & Pillinger, C.T. (1996) A carbon and nitrogen isotope study of diamond from primitive chondrites: Meteoritics & Planetary Science 31(3):343-355. (May 1996). Newton, J., Bischoff, A., Arden, J. W., Franchi, I. A., Geiger, T., Greshake, A. & Pillinger, C. T. (1995). Acfer 094, a uniquely primitive carbonaceous chondrite from the Sahara. Meteoritics 30 (1), 47-56. (Jan 1995). ; Gao, X., Amari, S., Messenger, S., Nittler, L. R., Swan, P. D. & Walker, R. M. (1996). Survey of circumstellar grains in the unique circumstellar carbonaceous chondrite Acfer 094. Meteoritics & Planetary Science 31(S4), p. A48. (July 1996). Khar'kiv, A. D., Levin, V. I., Mankenda, A., & Safronov, A. F. (1992). The Camafuca-Camazambo kimberlite pipe of Angola, the largest in the world. International Geology Review, 34(7), 710-719. Cruz, S. R., Watangua, M., Melgarejo, J. C., & Gali, S. (2008). New insights into the concept of ilmenite as an indicator for diamond exploration, based on kimberlit petrographic analysis. Revista de la sociedad española de mineralogia, 9, 205-206. Zinchenko, V.N. (2008): Geology of Ore Deposits 50(8), 806-814. Gordon, C., Ahmimed, C., Gizenga Ngolo, D., & Smillie, I. (2004). Diamond industry annual review, 2004: Republic of Angola. Huss, G. R., Meshik, A. P., Smith, J. B. & Hohenberg, C. M. (2003) Presolar diamond, silicon carbide, and graphite in carbonaceous chondrites: Implications for thermal processing in the solar nebula: Geochimica et Cosmochimica Acta, vol. 67, no. 24: pp. 4823-4848. (Dec 2003). Brown, R.E., Stroud, W.J. (1997) Metallogenic Study and Mineral Deposit Data Sheets, Inverell 1:250 000 Metallogenic Map SH/56-5. Geological Survey of New South Wales, Sydney, 576 pages. Davies, R.M., Griffin, W.L., O'Reilly, S.Y., Andrew, A.S. (2003) Unusual mineral inclusions and carbon isotopes of alluvial diamonds from Bingara, eastern Australia. Lithos, 69(1-2), 51-66.
ⓘ Ruby Hill Fossicking Reserve ? http://gemexplorer.org/archives/merlin-diamond-mine-australia North Australian Diamonds Limited website. ⓘ Sabbath Creek (Sunday Creek) ? Jaques, A.L., Lewis, J.D., Smith, C.B. (1986) The kimberlites and lamproites of Western Australia. Geological Survey of Western Australia, Bulletin No. 132, 268 pages. Gennady P. Vdovykin (1970). Ureilites. Space Science Reviews 10, #4, 483-510. Gennady P. Vdovykin (1970). Ureilites. Space Science Reviews 10, #4, 483-510.; Vdovykin, G. P. (1970) Ureilites: Space Science Reviews 10(4): 483-510. (Feb 1970). S. Mostefaoui, Ahmed El Goresy, P. Hoppe, P. Gillet & U. Ott (2001). In-Situ Discovery of Diamond in Bencubbin: Evidence from Raman Spectroscopy and Cathodoluminescence. Meteoritics & Planetary Science 36, Supplement, p. A141-142. online-wikipedia on Jack Hills; University of Wisconsin website which includes photos; Earth Obsevatory NASA mag online. AuDax Resources NL Annual Report 1995. [MinRec 21:561]; Rayner, M. J., Moss, S. W., Lorenz, V., Jaques, A. L., Boxer, G. L., Smith, C. B., & Webb, K. (2018). New insights into volcanic processes from deep mining of the southern diatreme within the Argyle lamproite pipe, Western Australia. Mineralogy and Petrology, 1-13. Mining Ann. Review (1985): 367. Shigley, J. E., Chapman, J., & Ellison, R. K. (2001). Discovery and mining of the Argyle diamond deposit, Australia. Gems & Gemology, 37(1), 26-41. Mining Ann. Review 91985): 147 & 415. Mining Ann. Review (1985) 147 & 415.; Morris, N. (2005) Diamonds and other gems. Appleseed Editions Ltd, East Sussex. Mining Ann. Review (1985) 147, 415, 417.; Schrauder, M. and Navon, O. (1994) Hydrous and carbonatitic mantle fluids in fibrous diamonds from Jwaneng, Botswana. Geochimica et Cosmochimica Acta: 58: 761-771.; Morris, N. (2005) Diamonds and other gems. Appleseed Editions Ltd, East Sussex. Palache, C., Berman, H., & Frondel, C. (1951), The System of Mineralogy of James Dwight Dana and Edward Salisbury Dana, Yale University 1837-1892, Volume II: 1006. Fleischer, R. (1998): Mineralium Deposita 33, 238-254. Principais Depósitos Minerais Brasileiros - Gemas e Rochas Ornamentais. DNPM, Vol. 4,161-176. De Brito Barreto, Sandra and Bretas Bittar, Sheila Maria. (2010) The gemstone deposits of Brazil: occurrences, production and economic impact. Bol. Soc. Geol. Mex [online]. 2010, vol.62, n.1, pp. 123-140. D. A. Zedgenizov, A. Shatskiy, A. L. Ragozin, H. Kagi and V. S. Shatsky (2014): Merwinite in diamond from São Luiz, Brazil: A new mineral of the Ca-rich mantle environment. American Mineralogist 99, 547-550. Hayman, P., Kopylova, M., and Kaminsky, F. 2005. Lower mantle diamonds from Rio Soriso (Juina area, Mato Grosso, Brazil). Contributions to Mineralogy and Petrology, 149(4): 430–445; Kaminsky, F. V., Wirth, R., & Schreiber, A. (2015). A microinclusion of lower-mantle rock and other mineral and nitrogen lower-mantle inclusions in a diamond. The Canadian Mineralogist, 53(1), 83-104. Ref. : Palache, C., Berman, H., & Frondel, C. (1951), The System of Mineralogy of James Dwight Dana and Edward Salisbury Dana, Yale University 1837-1892, Volume II: 833. Machado, I. F., and Figueirôa, S. F. de M., 2001, 500 years of mining in Brazil: a brief review: Resources Policy, v. 27, p. 9-24. Machado, I. F., and Figuerôa, S. F. de M., 2001, 500 years of mining in Brazil: a brief review: Resources Policy, v. 27, p. 9-24. Fernandes, A. G., Karfunkel, J., Hoover, D. B., Sgarbi, P. B. de A., Sgarbi, G. N. C., Oliveira, G. D., Gomes, J. C. de S. P., and Kambrock, K, 2014, The basal conglomerate of the Capacete Formation (Mata da Corda Group) and its relation to diamond distributions in Coromandel, Minas Gerais state, Brazil: Brazilian Jour. of Geology, v. 44, no. 1, p. 91-103. Chaves, M. L. S. C., 2012, Kimberlito Vargem-1 (Coromandel;, MG): bulk sample confirma mineralização diamantifera: Revista Escola Minas, Ouro Preto, v. 65, no. 4, p. 509-511. Fleischer, R. (1998):Mineralium Deposita 33, 238-254.
ⓘ Monte Carmelo claim ? Palache, C., Berman, H., & Frondel, C. (1951), The System of Mineralogy of James Dwight Dana and Edward Salisbury Dana, Yale University 1837-1892, Volume II: 839.; Hussak and Prior (1900) Mineralogical Magazine: 12: 244. S. S. Russell, C. T. Pillinger, J. W. Arden, M. R. Lee, and U. Ott (1992) A New Type of Meteoritic Diamond in the Enstatite Chondrite Abee. Science 10 April 1992: 256 (5054), 206-209. Eccles, D. R., Heaman, L. M., Luth, R. W., and Creaser, R. A., (2004). Petrogenesis of the Late Cretaceous northern Alberta kimberlite province. Lithos 76: 435-459. Harrison Cookenboo (1996) Ranch Lake Kimberlite In The Central Slave Craton: The Mantle Sample The Gangue Mineral Deposits Division, GAC 52:12-13; Northern Mineral Showings Database, NWT Geoscience Office. Yana Fedortchouk, Dante Canil and Jon A. Carlson (2005) Dissolution forms in Lac de Gras diamonds and their relationship to the temperature and redox state of kimberlite magma. Contributions to Mineralogy and Petrology 150:54-69; Masun, K. M. (1999). The petrography and mineralogy of the Lac de Gras kimberlite field, Slave Province, Northwest Territories: A comparative study. Master of science, Department of Geology, Lakehead University. Tappert, R., Stachel, T., Harris, J. W., & Shimizu, N. (2005). Mineral inclusions in diamonds from the Panda kimberlite, Slave Province, Canada. European Journal of Mineralogy, 17(3), 423-440. Feuchtwanger, L. (1872) A popular treatise on gems : in reference to their scientific value : a guide for the teacher of natural sciences, the jeweller, and amateur : together with a description of the elements of mineralogy, and all ornamental and architectural materials. New York, 4th edition, pg 528. Harris, G. A., Pearson, D. G., Liu, J., Hardman, M. F., Snyder, D. B., & Kelsch, D. (2018). Mantle composition, age and geotherm beneath the Darby kimberlite field, west central Rae Craton. Mineralogy and Petrology, 112(1), 57-70. De Stefano, A., Lefebvre, N., & Kopylova, M. (2006). Enigmatic diamonds in Archean calc-alkaline lamprophyres of Wawa, southern Ontario, Canada. Contributions to Mineralogy and Petrology, 151(2), 158-173.
van Straaten, B. I., Kopylova, M. G., Russell, J. K., Webb, K. J., & Smith, B. H. S. (2008). Discrimination of diamond resource and non-resource domains in the Victor North pyroclastic kimberlite, Canada. Journal of Volcanology and Geothermal Research, 174(1), 128-138. Chen Daogong, Ni Tao, and Xie Liewen (2007): Science in China, Series D (Earth Sciences), 50(7), 1013-1020. Fisenko, A.V. and L.F. Semenova (1997) On the Selection of Chondrites for Studying Interstellar Diamond. Vernadsky Institute of Geochemistry and Analytical Chemistry, Russian Academy of Sciences. Chen, M., Shu, J., Xie, X., & Tan, D. (2018). Maohokite, a post‐spinel polymorph of MgFe2O4 in shocked gneiss from the Xiuyan crater in China. Meteoritics & Planetary Science. Michaud, M. (2005). An overview of diamond exploration in the North China Craton. In Mineral Deposit Research: Meeting the Global Challenge (pp. 1547-1549). Springer, Berlin, Heidelberg. Shuguang Song, Lifei Zhang, Yaoling Niu, Li Su, Ping Jian, Dunyi Liu (2005): Earth and Planetary Science Letters 234, 99-118.
ⓘ Dongqiao ophiolite (Donqiao ophiolite) ? Robinson, P.T., Bai, W., Yang, J., and Fang, Q. (2004): Presented at the American Geophysical Union Fall Meeting 2004, Abstract V14A-08. Jingsui Yang, Zhongming Zhang, Xiangzhen Xu, Yuan Li, Jinyang Li, Yi Jia, hao Liu, and Dengzhu Ba (2010): Goldschmidt Conference Abstracts 2010. Moravec, B., Řídkošil, T.: K výskytu diamantu na ložisku Vestřev v Podkrkonoší. Minerál, 2008, roč. 16, č. 5, s. 442-449. Fisenko, A.V. and L.F. Semenova (1997) On the Selection of Chondrites for Studying Interstellar Diamond. Vernadsky Institute of Geochemistry and Analytical Chemistry, Russian Academy of Sciences. ; Lee M R, Russell S S, Arden J W, Pillinger C T (1995) Nierite (Si3N4), a new mineral from ordinary and enstatite chondrites, Meteoritics, 30, 387-398; Lee, M.R., Russell, S.S., Arden, J.W., & Pillinger, C.T. (1995) Nierite (Si3N4), a new mineral from ordinary and enstatite chondrites. Meteoritics 30 (4): 387-397. (July 1995). Diamond exploration in West Greenland – the Qaamasoq prospect. in Abdurrahman, A., J. C. Ø. Andersen, and B. J. Williamson. "Meeting of the Geological Society’s Mineral Deposits Studies Group was held on the 2nd–4th January 2013 at the University of Leicester, UK." Applied Earth Science (Trans. Inst. Min. Metall. B) 121.4 (2012): 184. Mining Ann. Review (1985):148 & 445. Edwards, M.G. (1917) The American Mineralogist, 2, #7, 88-89. Belyanin, G. A., Kramers, J. D., Andreoli, M. A., Greco, F., Gucsik, A., Makhubela, T. V., ... & Wiedenbeck, M. (2017). Petrography of the carbonaceous, diamond-bearing stone “Hypatia” from southwest Egypt: A contribution to the debate on its origin. Geochimica et Cosmochimica Acta. Hugh E. O'Brien and Matti Tyni (1999) Mineralogy and Geochemistry of Kimberlites and Related Rocks from Finland. Proceedings of the 7th International Kimberlite Conference, 1999, p.625-636. Vdovykin, G.P. 1972. Forms of carbon in the new Haverö ureilite of Finland. Meteoritics 7 (4) 547-552. P. Cartigny, (2010) Mantle-related carbonados? Geochemical insights from diamonds from the Dachine komatiite (French Guiana), Earth and Planetary Science Letters, Volume 296, Issues 3–4, 1 August 2010, Pages 329-339,; Ramon Capdevila, Nicholas Arndt, Jacques Letendre, Jean-Fran (1999) Diamonds in volcaniclastic komatiite from French Guiana [Internet]. Nature. 399:456–8. Chirico, P.G., Malpeli, K.C., Anum, Solomon, Phillips, E.C., (2010), Alluvial diamond resource potential and production capacity assessment of Ghana: U.S. Geological Survey Scientific Investigations Report 2010–5045, 25 p.
Stachel, T., and Harris, J.W. (1997): Contributions to Mineralogy and Petrology 127, 336-352. Kwamina B. Dickson (1969) A Historical Geography of Ghana. Cambridge University Press 394p. Weiss, Y., Kessel, R., Griffin, W. L., Kiflawi, I., Klein-BenDavid, O., Bell, D. R., ... & Navon, O. (2009). A new model for the evolution of diamond-forming fluids: Evidence from microinclusion-bearing diamonds from Kankan, Guinea. Lithos, 112, 660-674.; Stachel, T., Harris, J., Aulbach, S., & Deines, P. (2002). 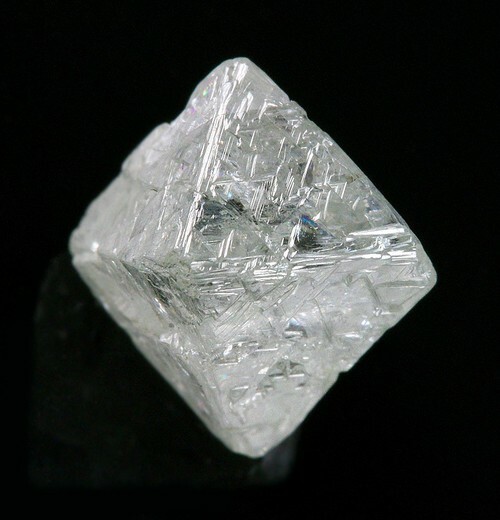 Kankan diamonds (Guinea) III: δ13C and nitrogen characteristics of deep diamonds. Contributions to Mineralogy and Petrology, 142(4), 465-475. Yager, T. R. (2004). Guinea, Liberia, AND Sierra Leone. USGS Minerals Yearbook, 3, 171. Report on the geology and diamond deposits of the Awarapari-Issineru-Putareng area, upper Mazaruni River. Geological Survey of British Guiana Bulletin, 17. Rao, N. C., Burgess, R., Anand, M., & Mainkar, D. (2007). ^ 4^ 0Ar-^ 3^ 9Ar Dating of the Kodomali Pipe, Bastar Craton, India: A Pan-African (491+/-11 Ma) Age of Diamondiferous Kimberlite Emplacement. Journal-Geological Society of India, 69(3), 539. Fisenko, A.V. and L.F. Semenova (1997) On the Selection of Chondrites for Studying Interstellar Diamond. Vernadsky Institute of Geochemistry and Analytical Chemistry, Russian Academy of Sciences. ; Huss, G.R. & Lewis, R.S. (1995) Presolar diamond, SiC, and graphite in primitive chondrites: Abundances as a function of meteorite class and petrologic type. Geochimica et Cosmochimica Acta 59 (1):115-160 (Jan 1995). Peters, S.G., Nokleberg, W.J., Doebrich, J.L., Bawiec, W.J., Orris, G., Sutphin, D.M., and, Wilburn, D.R., (2005) Geology and nonfuel mineral deposits of Asia and the Pacific: U.S. Geological Survey Open-File Report 2005-1294C, 67 p.
Alam, I. (2000). Diamond Mining and Trade in South India in the Seventeenth Century. The Medieval History Journal, 3(2), 291-310. N. Bhandari, V. G. Shah & A. Graham (1981). The Lahrauli ureilite. Meteoritics, vol. 16, #2, 185-191. (June 30, 1981). Posewitz, T. (1892). Borneo: its geology and mineral resources. E. Stanford. Setijadji, L.D., Basuki, N.I., Prihatmoko, S. (2010) Kalimantan mineral resources: an update on exploration and mining trends, synthesis on magmatism history and proposed models for metallic mineralization. Proceedings Pit Iagi Lombok, 39th IAGI Annual Convention and Exhibition. Fritsch, E. (1998). The nature of color in diamonds. The Nature of Diamonds, Cambridge University Press, Cambridge, UK, 23-47. Howard Coopersmith, Vered Toledo, John Ward, Michiel De Wit, R Spaggiari, Emmanuel Fritsch: "Geology and Exploration of Gem Deposits at Mt. Carmel, Northern Israel: Natural Moissanite, Sapphire, Ruby & Diamond." http://mayafiles.tase.co.il/RPdf/697001-698000/P697832-00.pdf; Griffin, W. L., Gain, S. E. M., Adams, D. T., Huang, J. X., Saunders, M., Toledo, V., ... & O’Reilly, S. Y. (2016). First terrestrial occurrence of tistarite (Ti2O3): Ultra-low oxygen fugacity in the upper mantle beneath Mount Carmel, Israel. Geology, 44(10), 815-818. Fisenko, A.V., and Semenova, L.F. (1999) On the selection of chondrites for studying interstellar diamond. Geochemistry International, 37, 10, 952-960; Abreau, N.M., and Brearley, A.J. (2005) Carbonates in Vigarano: Terrestrial, preterrestrial, or both? Meteoritics & Planetary Science, 40, 4, 609-625. Natural History Museum Vienna collection; Teeuw, R. M. (2002). Regolith and diamond deposits around Tortiya, Ivory Coast, West Africa. Catena, 49(1), 111-127. Pouclet A. (2004) Découverte d’un diatrème de kimberlite diamantifère. C.R.Geoscience 336, 9-17. Mizukami T., Wallis S., Enami M., Kagi H. (2008) Forearc diamond from Japan. Geology, Vol. 36, No. 3, p. 219. Hawthorne, F.C., Lussier, A.J., Ball, N.A., Henry, D.J., Shimizu, R., Ogasawara, Y., Ota, T. (2016): Maruyamaite, K(MgAl2)(Al5Mg)Si6O18(BO3)3(OH)3O, from the ultrahigh-pressure Kokchetav massif, northern Kazakhstan: Description and crystal structure. American Mineralogist, 101, 355-361.; Ogasawara, Y., Fukasawa, K., & Maruyama, S. (2002). Coesite exsolution from supersilicic titanite in UHP marble from the Kokchetav Massif, northern Kazakhstan. American Mineralogist, 87(4), 454-461. Dobrzhinetskaya, L.F., Green, H.W., Bozhilov, K.N., Mitchell, T.E., and Dickerson, R.M. (2003): Journal of Metamorphic Geology 21, 425-437.; Erlich, E.I., and Hausel, D.W. (2002): Diamond Deposits: Origin, Exploration and History of Discovery. SME Publishing, Littleton (CO), USA, pp. 179-190. USGS (2005) MInerals Yearbook 2004.
ⓘ Grand Cape Mount Co.
ⓘ Rienana River alluvials ? I. Kusnir (1999) Gold in Mali. Acta Montanistica 4:311-318; Chirico, Peter G.; Barthelemy, Francis; Kone, Fatiaga (2010) Alluvial diamond resource potential and production capacity assessment of Mali. USGS Scientific Investigations Report Number 2010-5044; Currier, R., Pohl, D. (2011) Mineral Collecting in Mali. Mineralogical Record 42(3) 231-250. Investors Brief, Rex Diamond Mining Corp., Ltd.
Investors Brief, Rex Diamond Mining Corp. Ltd.; http://users.pandora.be/Globaltrade/streetwire.html. I. Weber & Adolf Bischoff (1999). Microstructures in Pyroxenes from the Martian Meteorites Zagami and the Achondrites Bishopville (Aubrite), Hammadah Al Hamra 064, and Jalanash (Ureilites). Meteoritics & Planetary Science, vol. 34, Supplement, pp. A120-A121. (July1999). Grossman, J. N. & Zipfel, J. (2001). The Meteoritical Bulletin, No. 85, 2001 September. Meteoritics & Planetary Science 36 (9,Suppl. ): A293-A322. (Sept 2001). Win, T.T., Davies, R.M., Griffin, W.L., Wathanakul, P. & French, D.H. (2001): Distribution and characteristics of diamonds from Myanmar. Journal of Asian Earth Sciences, 19, 563-577. Win, T. T., Davies, R. M., Griffin, W. L., Wathanakul, P., & French, D. H. (2001). Distribution and characteristics of diamonds from Myanmar. Journal of Asian Earth Sciences, 19(5), 563-577.
http://www.es.mq.edu.au/GEMOC/Abstrfull98/Griffin982.htm; Win, T. T., Davies, R. M., Griffin, W. L., Wathanakul, P., & French, D. H. (2001). Distribution and characteristics of diamonds from Myanmar. Journal of Asian Earth Sciences, 19(5), 563-577. Daul, J., Bauer, K. & Moser, P. (1993): Bergbau in Namiba - Erfahrungen einer Studienreise. Institut für Bergbaukunde, Bergtechnik und Bergwirtschaft, Wissenschaftliche Schriftenreihe No. 3, Leoben, Austria, 130 pp (in German). Smith, G. G., Mocke, G. P., & Swart, D. H. (1994). Modelling and analysis techniques to aid mining operations on the Namibian coastline. Coastal Engineering Proceedings, 1(24). ; Roesener, H. (2000). Diamond Mining Along The Coast Of Namibia. In Proceedings Of Workshops. Jacob, R. J., Bluck, B. J., & Ward, J. D. (1999). Tertiary-age diamondiferous fluid deposits of the lower Orange River valley, Southwest Africa. Economic Geology, 94(5), 749-758. Huizing, T. E., & Kampf, A. R. (2008). A Namibian Diamond Adventure. Rocks & Minerals, 83(6), 486-501. Garvie, L. A. J.; Németh, P.; Buseck, P. R. (2011). Diamond, Bucky-Diamond, Graphite-Diamond, Al-Silicate, and Stishovite in the Gujba CB Chondrite. 74th Annual Meeting of the Meteoritical Society, held August 8-12, 2011 in London, UK. Published in Meteoritics and Planetary Science Supplement, id. #5227. Russell, S. S. & 7 others (2005). The Meteoritical Bulletin, No. 89, 2005 September. Meteoritics & Planetary Science 40 (9,Suppl. ): A201-A263. (Sept 2005). ; Voropaev & 5 others. (2013) Mineralogy and In-Situ Micro-Raman Studies of Carbon Phases in Ureilite JaH 054: Lunar and Planetary Science Conference XLIV. LPI Contribution #1719: p.1140. (Mar 2013). Galimov, E. M., Palazhchenko, O. V., Verichev, E. M., Garanin, V. K., & Golovin, N. N. (2008). Carbon isotopic composition of diamonds from the Archangelsk diamond province. Geochemistry International, 46(10), 961-970. Rubanova, E. V., Palazhchenko, O. V., & Garanin, V. K. (2009). Diamonds from the V. Grib pipe, Arkhangelsk kimberlite province, Russia. Lithos, 112, 880-885.; Kononova, V.A., Golubeva, Y.Y., Bogatikov, O.A., and Kargin, A.V. (2007): Diamond Resource Potential of Kimberlites from the Zimny Bereg Field, Arkhangel’sk Oblast. Geology of Ore Deposits 49(6), 421-441. Kononova, V.A., Golubeva, Y.Y., Bogatikov, O.A., and Kargin, A.V. (2007): Geology of Ore Deposits 49(6), 421-441. Turner, A., Drummond, M.S., Kepezhinskas, P., and Defant, M.J. (1996) Mineralogy and Geochemistry of mantle Xenoliths and Host Volcanics of the Avachinsky Volcano, Kamchatka Arc, Russia. 1996 Abstracts with Programs, The Geological Society of America. Karpov, G.A., Silaev, V.I., Anikin, L.P., Rakin, V.I., Vasil’ev, E.A., Filatov, S.K., Petrovskii, V.A., Flerov, G.B. (2015) Diamonds and Accessory Minerals in Products of the 2012–2013 Tolbachik Fissure Eruption. Journal of Volcanology and Seismology, 8, 323-339. Ohfuji, H., Irifune, T., Litasov, K. D., Yamashita, T., Isobe, F., Afanasiev, V. P., & Pokhilenko, N. P. (2015). Natural occurrence of pure nano-polycrystalline diamond from impact crater. Scientific reports, 5, 14702. Grieve, R. A. (2013). Economic deposits at terrestrial impact structures. in Impact Cratering: Processes and Products, First Edition. Edited by Gordon R. Osinski and Elisabetta Pierazzo. Blackwell Publishing Ltd.
Seliverstov V.A., Gorshkov A.I., Shcheka S.A., Sivtsov A.V. (1996) Diamonds and carbonadoof Primorskii Krai: mineralogy, crystal; chemistry and genesis, - Geologiya Rudnyh Mestorozhdenii, v.38, №6, p.485-499 (in Russian). Shcheka, S. A., Ignat’ev, A. V., Nechaev, V. P., & Zvereva, V. P. (2006). First diamonds from placers in Primorie. Petrology, 14(3), 299-317. Zinchuk, N.N., and Koptil, V.I. (2007): Geology of Ore Deposits 49(4), 308-317.; Sobolev, N. V., Logvinova, A. M., Zedgenizov, D. A., Yefimova, E. S., Taylor, L. A., Promprated, P., ... & Zinchuk, N. N. (2003). Mineral inclusions in diamonds from Komsomolskaya and Krasnopresnenskaya pipes, Yakutia: Evidence for deep lithospheric heterogeineties in Siberian craton [ext. abs.]. In 8th International Kimberlite Conference, Extented Abstracts Vol., FLA0141. Patchen, A. D., Taylor, L. A., & Pokhilenko, N. (1997). Ferrous freudenbergite in ilmenite megacrysts: A unique paragenesis from the Dalnaya kimberlite, Yakutia. American Mineralogist, 82(9), 991-1000.; Bulanova, G. P., Griffin, W. L., Kaminsky, F. V., Davies, R., Ryan, C. G., Andrew, A. S., ... & Zahkarchenko, O. D. (2000). Diamonds from Zarnitsa and Dalnaya kimberlites (Yakutia): Their nature, growth history, and lithospheric mantle source. EDITED BY ANITA S. ANDREW PHILIP K. SECCOMBE, 21. [AmMin 84:993]; Sharygin, I. S., Golovin, A. V., Korsakov, A. V., & Pokhilenko, N. P. (2013). Eitelite in sheared peridotite xenoliths from Udachnaya-East kimberlite pipe (Russia)–a new locality and host rock type. European Journal of Mineralogy, 25(5), 825-834.; Malkovets, V. G., Pokhilenko, L. N., & Pokhilenko, N. P. (2013). Geochemistry of megacrystalline pyrope peridotites from the Udachnaya pipe, Siberian craton. Crystallogenesis and Mineralogy, 245.; Skvortsova V, Samoylovich M, Belyanin A (2014) Iron containing surfaces of contact of diamond with kimberlite. 21 st meeting of the International Mineralogical Association. Kostrovitsky, S. I., Alymova, N. V., Yakovlev, D. A., Serov, I. V., Ivanov, A. S., & Serov, V. P. (2006, January). Specific features of picroilmenite composition in various diamondiferous fields of the Yakutian province. In Doklady earth sciences (Vol. 406, No. 1, pp. 19-23). MAIK Nauka/Interperiodica. ; Bulanova, G. P., Griffin, W. L., Kaminsky, F. V., Davies, R., Ryan, C. G., Andrew, A. S., ... & Zahkarchenko, O. D. (2000). Diamonds from Zarnitsa and Dalnaya kimberlites (Yakutia): Their nature, growth history, and lithospheric mantle source. EDITED BY ANITA S. ANDREW PHILIP K. SECCOMBE, 21. Sharygin, I. S., Golovin, A. V., & Pokhilenko, N. P. (2011, February). Djerfisherite in Kimberlites of the Kuoikskoe field as an indicator of enrichment of Kimberlite melts in chlorine. In Doklady Earth Sciences (Vol. 436, No. 2, pp. 301-307). MAIK Nauka/Interperiodica. Zedgenizov, D. A., Araujo, D., Ragozin, A. L., Shatsky, V. S., Kagi, H., & Griffin, W. L. (2008). Carbonatitic to Hydrous Silicic Growth Medium of Diamonds from Internatsionalnaya Kimberlite Pipe, Yakutia. In Extended Abstracts of 9th International Kimberlite Conference. Spetsius, Z. V., Mityukhin, S. I., Ivanov, A. S., & Banzeruk, S. V. (2005). Paragenesis of inclusions in diamonds from the botoubinskaya kimberlite pipe, Nakyn field, Yakutia. In Doklady earth sciences (Vol. 403, pp. 808-811). Springer. Spetsius, Z. V., Taylor, L. A., Valley, J. W., Deangelis, M. T., Spicuzza, M., Ivanov, A. S., & Banzeruk, V. I. (2008). Diamondiferous xenoliths from crustal subduction: garnet oxygen isotopes from the Nyurbinskaya pipe, Yakutia. European Journal of Mineralogy, 20(3), 375-385; Riches, A. J., Liu, Y., Day, J., Spetsius, Z. V., & Taylor, L. A. (2010). Subducted oceanic crust as diamond hosts revealed by garnets of mantle xenoliths from Nyurbinskaya, Siberia. Lithos, 120(3), 368-378. Williams, G. F. (2011). The diamond mines of South Africa: Some account of their rise and development. Cambridge University Press. Rocks & Min. : 23: 608; Bureau of Mines Mineral Trade Notes (Jan 1948). Mining Ann. Review (1985): 147. Field, M., Stiefenhofer, J., Robey, J., and Kurszlaukis, S. (2008): Ore Geology Reviews 34, 33-75.; Westerlund, K. J., & Gurney, J. J. (2004). Silicate and oxide inclusion characteristics and infra-red absorption analysis of diamonds from the Klipspringer kimberlites, South Africa. South African Journal of Geology, 107(1-2), 131-146. Field, M., Stiefenhofer, J., Robey, J., and Kurszlaukis, S. (2008): Ore Geology Reviews 34, 33-75.; Hammond, A. L., & Mitchell, R. H. (2002). Accessory mineralogy of orangeite from Swartruggens, South Africa. Mineralogy and Petrology, 76(1-2), 1-19. Minerals of South Africa; Wilson, M. G. C., Henry, G., & Marshall, T. R. (2006). A review of the alluvial diamond industry and the gravels of the North West Province, South Africa. South African Journal of Geology, 109(3), 301-314. Dana 7:I:149.; Giuliani, A., Kamenetsky, V. S., Phillips, D., Kendrick, M. A., Wyatt, B. A., & Goemann, K. (2012). Nature of alkali-carbonate fluids in the sub-continental lithospheric mantle. Geology, 40(11), 967-970. Dana 7:I:149; Mining Annual Review (1985): 147; Rocks & Min. : 18:74. Contributions to Mineralogy and Petrology (Historical Archives), V 110, N 1, March 1992, pp. 133-138. Stow, G. W., & Jones, T. R. (1874). Geological notes upon Griqualand West with descriptions of the specimens. Quarterly Journal of the Geological Society, 30(1-4), 581-680. Laurance A. J. Garvie & Peter R. Buseck (2007). Prebiotic carbon in clays from Orguril and Ivuna (CI). Meteoritics & Planetary Science 42, #12, 2111-2117. Mining Ann. Review (1985): 440; Rocks & Min. : 22:306.; Mathias, M., Siebert, J.C., and Rickwood, P.C. (1970): Contributions to Mineralogy and Petrology 26, 75-123.; Stachel, T., Harris, J. W., & Brey, G. P. (1998). Rare and unusual mineral inclusions in diamonds from Mwadui, Tanzania. Contributions to Mineralogy and Petrology, 132(1), 34-47. Gursky D, Nechaev S & Bobrov A (2001) Titanium deposits in Ukraine focussed on the Proterozoic anorthosite-hosted massives. in Abstracts – GEODE field workshop 8-12th July 2001 on ilmenite deposits in the Rogaland anorthosite province, S. Norway. A. V. Okotrub, L. G. Bulusheva, A. V. Guselnikov, B. A. Kolesov, Yu. P. Dikov, S. L. Molodtsov (2007). Electronic state of carbon in carbonaceous chondrite meteorites. physica status solidi (b) Vol 244, #11 (Special Issue: Electronic Properties of Novel Nanostructures), 3955–3959. (Nov 2007). Mineralogy of Arizona (1977): 94; Peirce, H.W. (1990), AZ Geol. Sur. Industrial Minerals card file. Anthony, J.W., et al (1995), Mineralogy of Arizona, 3rd.ed. : 203; Frondel, C. & U.B. Marvin (1967a), Lonsdaleite, a new hexagonal polymorph of diamond. Nature: 214: 587-589; Foote, A.E. (1891a), A new locality for meteoric iron with a preliminary notice of the discovery of diamonds in the iron, Amer. Jour. Sci. : 42: 413-417; Kunz, G.F. & C.W. Huntington (1893), On the diamond in the Cañon Diablo meteoric iron and on the hardness of carborundum, Amer. Jour. Sci. : 46: 470-471; Ksanda, C.J. & E.P. Henderson (1939), Identification of diamond in the Canyon Diablo iron, Am.Min. : 24: 677-680. Howard, J. M. (1987) Mineral Species of Arkansas: A Digest. Bull 23 Ark. Geol. Comm. Rocks & Min. :63:115; Stroud, et al(1969). Silliman, Benjamin, Jr. (1867b), Notice of the new localities of diamonds in California: California Academy of Natural Sciences Proceedings: 3: 354-355; Hanks, Henry Garber (1882b), Diamonds in California: California Mining Bureau. Report 2: 241-254; Kunz, George Frederick (1905a), Gems, jewelers’ materials, and ornamental stones of California: California Division Mines Bulletin 37, 171 pp. : 40; Murdoch, Joseph & Robert W. Webb (1966), Minerals of California, Centennial Volume (1866-1966): California Division Mines & Geology Bulletin 189: 170. Turner, Henry Ward (1899), The occurrence and origin of diamonds in California: American Geologist: 23: 183; Murdoch, Joseph & Robert W. Webb (1966), Minerals of California, Centennial Volume (1866-1966): California Division Mines & Geology Bulletin 189: 170. Sperisen, Francis J. (1938), Gem minerals of California: California Division Mines Report 34: 39; Murdoch, Joseph & Robert W. Webb (1966), Minerals of California, Centennial Volume (1866-1966): California Division Mines & Geology Bulletin 189: 168. Whitney, J.D. (1865), Geological survey of California, Geology, 1, Report of progress and synopsis of the field work from 1860to 1864; […(abstract): American Journal of Science, 2nd. series: 41: 124, 231-246, 351-368]: 276; Hanks, Henry Garber (1882b), Diamonds in California: California Mining Bureau. Report 2: 253; Hanks, Henry Garber (1884), Fourth report of the State Mineralogist: California Mining Bureau. Report 4, 410 pp. (includes catalog of minerals of California pp. 63-410), and miscellaneous observations on mineral products): 169; Kunz, George Frederick (1905a), Gems, jewelers’ materials, and ornamental stones of California: California Division Mines Bulletin 37, 171 pp. : 40. USGS (2005), Mineral Resources Data System (MRDS): U.S. Geological Survey, Reston, Virginia, loc. file ID #10028324. USGS (2005), Mineral Resources Data System (MRDS): U.S. Geological Survey, Reston, Virginia, loc. file ID #10028438 & 10284181. Silliman, Benjamin, Jr. (1867b), Notice of the new localities of diamonds in California: California Academy of Natural Sciences Proceedings: 3: 354-355; Silliman, Benjamin, Jr. (1873b): American Journal of Science, 3rd. series: 6: 133; Hanks, Henry Garber (1884), Fourth report of the State Mineralogist: California Mining Bureau. Report 4, 410 pp. : 170; Kunz, George Frederick (1905a), Gems, jewelers’ materials, and ornamental stones of California: California Division Mines Bulletin 37: 41, 42; Sterrett, Douglas Bovard (1911), Gems and precious stones. Mineral Resources of the United States for 1910, part 2; U.S. Geological Survey: 859; Sterrett, Douglas Bovard (1913), Gems and precious stones: Mineral Resources U.S., 1912, part 2: 1040; Sterrett, Douglas Bovard (1914), Gems and precious stones. Mineral Resources of the United States for 1913; part 2; Department of the Interior, U.S. Geological Survey: 651; Schaller, Waldemar Theodore (1919), Gems and precious stones: Mineral Resources U.S., 1916, part 2; Department of the Interior, Geological Survey: 892; Mineralogical Record 20 129-142; Rocks & Minerals (1934): 9: 179; Rocks & Minerals (1935): 10: 26; USGS (2005), Mineral Resources Data System (MRDS): U.S. Geological Survey, Reston, Virginia, loc. file ID #10310601. Kunz, George Frederick (1905a), Gems, jewelers’ materials, and ornamental stones of California: California Division Mines Bulletin 37, 171 pp. : 43; Sterrett, Douglas Bovard (1907), Precious stones: Mineral Resources U.S., 1906, part 2: 1217; Murdoch, Joseph & Robert W. Webb (1966), Minerals of California, Centennial Volume (1866-1966): California Division Mines & Geology Bulletin 189: 170. Waring, Clarence A. (1919), Butte, Placer, Sacramento, Yuba Counties: California Bureau of Mines Report 15: 187; Murdoch, Joseph & Robert W. Webb (1966), Minerals of California, Centennial Volume (1866-1966): California Division Mines & Geology Bulletin 189: 170. Hanks, Henry Garber (1882b), Diamonds in California: California Mining Bureau. Report 2: 252; Hanks, Henry Garber (1884), Fourth report of the State Mineralogist: California Mining Bureau. Report 4, 410 pp. (includes catalog of minerals of California pp. 63-410), and miscellaneous observations on mineral products): 171; Kunz, George Frederick (1905a), Gems, jewelers’ materials, and ornamental stones of California: California Division Mines Bulletin 37, 171 pp. : 42; Bradley, W.W. (1928), California’s commercial nonmetallic minerals: Mining Congress Journal: 14: 669-678; Bradley, W.W. (1938), California’s commercial minerals: Mining Congress Journal: 24: 16. Hanks, Henry Garber (1884), Fourth report of the State Mineralogist: California Mining Bureau. Report 4, 410 pp. : 170; Kunz, George Frederick (1905a), Gems, jewelers’ materials, and ornamental stones of California: California Division Mines Bulletin 37, 171 pp. : 43; Murdoch, Joseph & Robert W. Webb (1966), Minerals of California, Centennial Volume (1866-1966): California Division Mines & Geology Bulletin 189: 170. Hanks, Henry Garber (1882b), Diamonds in California: California Mining Bureau. Report 2: 250; Hanks, Henry Garber (1884), Fourth report of the State Mineralogist: California Mining Bureau. Report 4, 410 pp. (includes catalog of minerals of California pp. 63-410), and miscellaneous observations on mineral products): 168, 169; Kunz, George Frederick (1905a), Gems, jewelers’ materials, and ornamental stones of California: California Division Mines Bulletin 37, 171 pp. : 44. USGS (2005), Mineral Resources Data System (MRDS): U.S. Geological Survey, Reston, Virginia, loc. file ID #10092166. Evans, Burr (1916), Diamonds of Smiths Flat: Engineering & Mining Journal: 102: 814; Pemberton, H. Earl (1983), Minerals of California; Van Nostrand Reinholt Press: 54, photo 2-7. Silliman, Benjamin, Jr. (1867c), On new localities of diamonds in California: American Journal of Science, 2nd. series: 44: 119; Kunz, George Frederick (1905a), Gems, jewelers’ materials, and ornamental stones of California: California Division Mines Bulletin 37, 171 pp. : 43; Murdoch, Joseph & Robert W. Webb (1966), Minerals of California, Centennial Volume (1866-1966): California Division Mines & Geology Bulletin 189: 171. Kunz, George Frederick (1905a), Gems, jewelers’ materials, and ornamental stones of California: California Division Mines Bulletin 37, 171 pp. : 169; Murdoch, Joseph & Robert W. Webb (1966), Minerals of California, Centennial Volume (1866-1966): California Division Mines & Geology Bulletin 189: 171. Hanks, Henry Garber (1870), Diamonds in California: Mining and Scientific Press: 20: 162; Hanks, Henry Garber (1884), Fourth report of the State Mineralogist: California Mining Bureau. Report 4, 410 pp. : 310; Kunz, George Frederick (1905a), Gems, jewelers’ materials, and ornamental stones of California: California Division Mines Bulletin 37, 171 pp. : 44; Pemberton, H. Earl (1983), Minerals of California; Van Nostrand Reinholt Press: 54. Mining and Scientific Press (1870), California diamonds: Mining and Scientific Press: 20: 194; Murdoch, Joseph & Robert W. Webb (1966), Minerals of California, Centennial Volume (1866-1966): California Division Mines & Geology Bulletin 189: 171. Hanks, Henry Garber (1882b), Diamonds in California: California Mining Bureau. Report 2: 251; Hanks, Henry Garber (1884), Fourth report of the State Mineralogist: California Mining Bureau. Report 4, 410 pp. : 169; Kunz, George Frederick (1905a), Gems, jewelers’ materials, and ornamental stones of California: California Division Mines Bulletin 37, 171 pp. : 44; Pemberton, H. Earl (1983), Minerals of California; Van Nostrand Reinholt Press: 54. Silliman, Benjamin, Jr. (1867c), On new localities of diamonds in California: American Journal of Science, 2nd. series: 44: 119; Clark, Wm. B. (1970a) Gold districts of California: California Division Mines & Geology Bulletin 193; Pemberton, H. Earl (1983), Minerals of California; Van Nostrand Reinholt Press: 54. Kunz, George Frederick (1905a), Gems, jewelers’ materials, and ornamental stones of California: California Division Mines Bulletin 37, 171 pp. : 31; Bradley, W.W. (1928), California’s commercial nonmetallic minerals: Mining Congress Journal: 14: 669; Murdoch, Joseph & Robert W. Webb (1966), Minerals of California, Centennial Volume (1866-1966): California Division Mines & Geology Bulletin 189: 171. Kunz, George Frederick (1900), Precious stones: Mineral Resources U.S., 1899: 423; Murdoch, Joseph & Robert W. Webb (1966), Minerals of California, Centennial Volume (1866-1966): California Division Mines & Geology Bulletin 189: 171. Sterrett, Douglas Bovard (1914), Gems and precious stones. Mineral Resources of the United States for 1913; part 2; Department of the Interior, U.S. Geological Survey: 651; Murdoch, Joseph & Robert W. Webb (1966), Minerals of California, Centennial Volume (1866-1966): California Division Mines & Geology Bulletin 189: 171. Weber, F. H. (1963a). Geology and mineral resources of San Diego County, California. California Division of Mines and Geology, County Report 3: P. 104. Gems Gemol. 26 (3): 212-219. Kunz, George Frederick (1896), Precious stones: Mineral Resources U.S., 1895: 896; Murdoch, Joseph & Robert W. Webb (1966), Minerals of California, Centennial Volume (1866-1966): California Division Mines & Geology Bulletin 189: 171. Rocks & Min. : 59: 35-36. 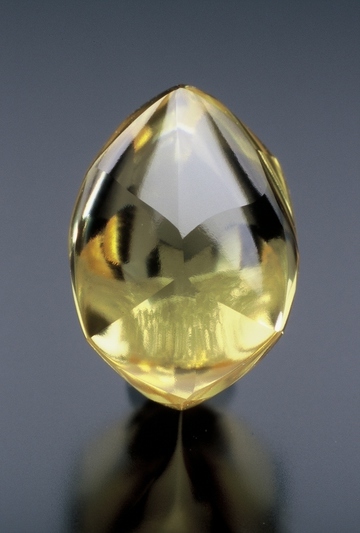 Jarnot, Bruce and Jarnot, Miranda (2004): "Gem Almandine from Colchester, Connecticut," in: abstracts of the 31st Rochester Mineralogical Symposium, April 15-18, 2004, pp 13-14. Geochimica et Cosmochimica Acta, vol. 40, Dec. 1976, p. 1429-1437. Dana 6: 6, 1076; Rocks & Min. : 60:75. Nitze, Henry B. C., 1895, Monazite, and Monazite Deposits in North Carolina, Bulletin 9, North Carolina Geological Survey, pp. 47. Rocks & Min. :60:75; Dana 6: 1078. Blatchley, W.S. (1902) Gold and Diamonds in Indiana. 27th Annual Report of Geology and Natural Resources: 46. Gunn, C.B. (1968) A descriptive catalog of the drift diamonds of the Great Lakes region, North America. Gems and Gemology: 12(11): 302. Hansen (1982) Diamonds from Ohio. Ohio Geology Newsletter, Fall 1982: 1. Hansen (1985) Additional notes on Ohio diamonds. Ohio Geology Newsletter, Winter 1985: 1. Carlson, E.H. (1991) Minerals of Ohio: Ohio Department of Natural Resources, Bulletin 69, First Edition: 101. Carlson, E.H. (2015) Minerals of Ohio: Ohio Department of Natural Resources, Bulletin 69, Second Edition: 173. Huss, G.R. & Lewis, R.S. (1995) Presolar diamond, SiC, and graphite in primitive chondrites: Abundances as a function of meteorite class and petrologic type. Geochimica et Cosmochimica Acta 59 (1):115-160. (Jan 1995). Cannon, W. & M. Mudrey (1981) The potential for diamond-bearing kimberlite in northern Michigan and Wisconsin: U. S. Geological Survey: Circular 842: 4. Carlson, S. & G. Adams (1998) The diamondiferous Six-Pak Ultramafic Lamprophyre Diatreme, Kenosha, Wisconsin, U.S.A.: 43rd. Institute on Lake Superior Geology Abst. with Programs: 11-12. Cannon, W. and M. Mudrey (1981) The potential for diamond-bearing kimberlite in northern Michigan and Wisconsin: U. S. Geological Survey: Circular 842: 4. Cannon, W.F. & M.G. Mudrey (1981) The potential for diamond-bearing kimberlite in northern Michigan and Wisconsin: USGS Circular 842, 15 p.
Cannon, W.F. & Mudrey, M.G. (1981) The potential for diamond-bearing kimberlite in northern Michigan and Wisconsin: U.S. Geological survey Circular: 842: 15 p.
A. V. Golovko and F. V. Kaminsky (2010): The Shoshonite-Absarokite-Picrite Karashoho Pipe, Uzbekistan: An Unusual Diamond Deposit in an Atypical Tectonic Environment. Economic Geology 105, 825-840. Yusupov, R.G. , et al. : Mavlyanovite, a new mineral species from a lamproite diatreme, Chatkal Ridge, Uzbekistan. Mineralogical Magazine 73,43-50 (2009). Kaminsky, F.V., Zakharchenko, O.D., Griffin, W.L., DeR.Channer, D.M., Khachatryan-Blinova, G.K. (2000) Diamond from the Guaniamo Area, Venezuela. The Canadian Mineralogist, 38:6, 1347-1370. NEWMAN, José Albino et al. Mineralogicalcharacterization of the diamond of the alluvial placer from Icabaru River, Santa Elena de Uairén, Bolivar State, Venezuela. Rev. Asoc. Geol. Argent. [online]. 2009, vol.64, n.3, pp. 472-480. NEWMAN, José Albino et al. Mineralogical characterization of the diamond of the alluvial placer from Icabaru River, Santa Elena de Uairén, Bolivar State, Venezuela. Rev. Asoc. Geol. Argent. [online]. 2009, vol.64, n.3, pp. 472-480. Cairncross, B. (2004) Field Guide To Rocks & Minerals Of Southern Africa: 90. Dana 6:A3:32. Cairncross, B. (2004) Field Guide To Rocks & Minerals Of Southern Africa: 90. Rocks & Minerals (1955) 30:464-471. Cairncross, B. (2004) Field Guide To Rocks & Minerals Of Southern Africa: 90. Field, M., Stiefenhofer, J., Robey, J., and Kurszlaukis, S. (2008): Ore Geology Reviews 34, 33-75. Cairncross, B. (2004) Field Guide To Rocks & Minerals Of Southern Africa: 90.
ⓘ 55 Cancri e ?